For more than 90 years, the Rotary Club of Chula Vista has been an organization where local professionals with diverse backgrounds could exchange ideas, form meaningful lifelong friendships, and give back to their communities. Chartered on Feb. 16, 1926, Chula Vista Rotarians have since built homes for the homeless, drilled wells in the Philippines, provided scholarships to local students, helped victims of natural disasters, fought the scourge of polio, developed young leaders, and worked to make lives better in your community and around the globe. We have been and always will be committed to a sense of service above self. Our history demonstrates it. Our future will be defined by it. Want to make history with us? Today, Rotary remains grassroots at the core, and links 1.2 million members to form an organization of international scope. 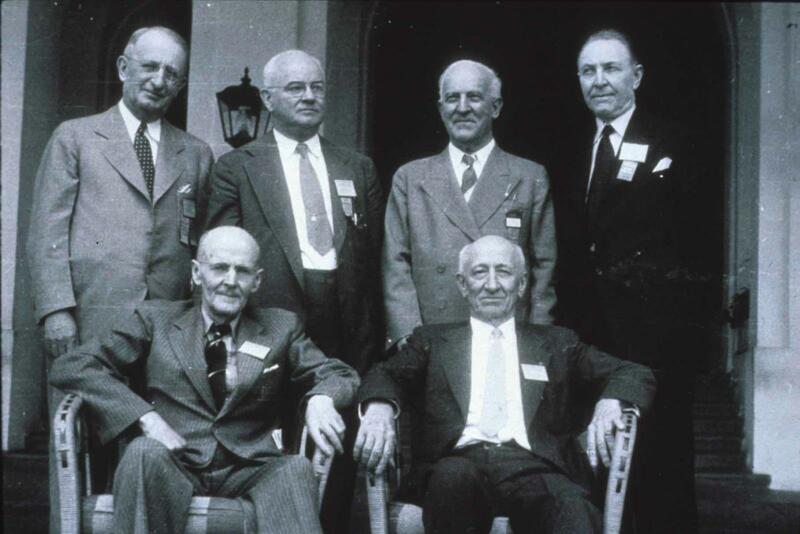 The first six Presidents of Rotary International at the 1939 Rotary convention in Cleveland, OH, USA. Font row, from left: Paul P. Harris, the founder of Rotary, and Glenn C. Mead. Back row, from left: Russsell F. Greiner, Frank L. Mulholland, Allen D. Albert, and Arch C. Klumph. The following is based on a transcription from a document hand written in September 1981, by Cal Lauderbach, a Charter Member of the Chula Vista Rotary Club, telling of the first years of the Club. It has been edited and updated to respond to the history request from PDG Pat Crowell dated August 20, 2008. Five Chula Vista businessmen met at the office of Ed Melville, 305 Third Ave to discuss the procedure for forming a Chula Vista Rotary Club. This was in January, 1926, and it might be said that Chula Vista Rotary was born at that meeting. 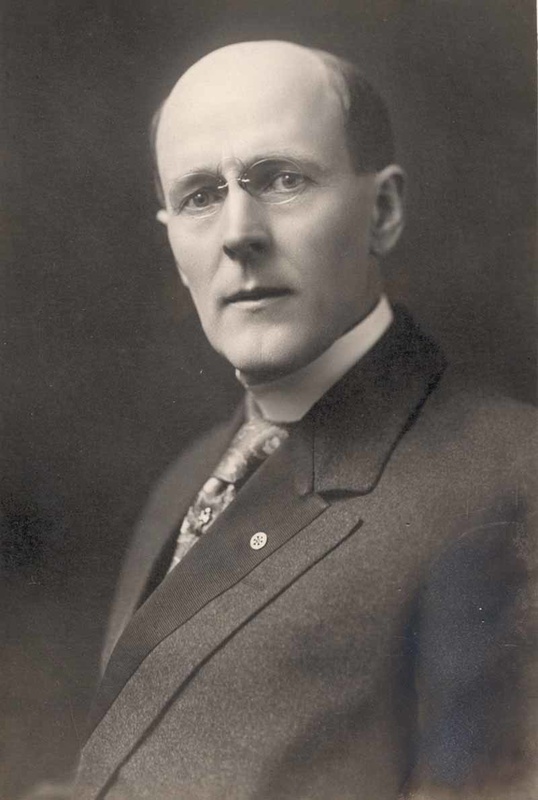 The Club was sponsored by the San Diego Club, under the immediate help and guidance of Hal Hobson of that Club. After preparing and submitting the application, the Charter was officially presented on Feb. 16th, 1926. There were 24 charter members included in the application. The first meeting was held in the Fire Station bldg – near the corner of “F” Street and 3rd Avenue – after about a year, the meeting place was changed to the San Diego Country Club. The San Diego Rotary Club carefully nurtured the Chula Vista Club during the first year, inviting the club to a number of joint meetings. The Club was fortunate that first year to have Warner Edmonds, local bank manager, as its First President. Warner was a leading business and Council leader, and laid a firm foundation. The Second President was Dr. Felix Ashcroft, whose scintillating wit and humor kept the meetings lively. Felix continued to build upon the early foundation. The Third President was Cal Lauderbach (writer of this in 1981) , a leader in the educational community. In 1931, during the Presidency of Arthur Done, the Chula Vista Club sponsored a club in Tijuana, Mex. as a project in International Service. Our club has produced three District Governors, George Ash in 1945-46, George Cornell in 1965-66 and Dave Allen in 1989-90. In October, 1960, President Eisenhower attended one of our meetings at the San Diego Country Club. There is no doubt about it – the visit by President Eisenhower was one of the biggest events ever in Chula Vista history and was certainly the most impressive meeting the club ever staged. And for one day the news of the world was datelined: Chula Vista, California, October 21, 1960! Retired Judge Manuel Kugler is currently spearheading a tree planting and plaques at the Chula Vista City Hall to commemorate the occasion. Judge Kugler was the program chairman for the Eisenhower visit. On 1/5/1926 the San Diego Rotary Club newsletter “The Rotator” had the following quote: "Beginning this week the Chula Vista Rotary club will become reality. This will give another close point of contact for makeup of attendance and extend the idea of service throughout the County. Hal Hobson, the daddy of this club and other officers who attended this initial meeting, are to be highly commended for their efforts in selling the idea and ideals of Rotary to the Chula Vista businessmen." The actual meeting that is referred to took place in the office of Ed Melville in Chula Vista at the corner of Third and F Street. That building is owned today by a Rotarian and a Kiwanian. They had invited an attorney from San Diego, Harvey Atherton, to come out and talk to them. This group of Chula Vista businessmen wanted to get together to form a service club. They were concerned about some of the requirements that Kiwanis had and therefore turned to Hal Hobson of San Diego Rotary to have him explain the Rotary possibility. His message has prevailed. Ed Melville came from Missouri and traded sight unseen for lemon orchards in 1901. He began building buildings, including the Security Bank. This was the building in which the group met. He acquired large chunks of land around that building which became known as the Melville block. He also acquired land at Fourth and E St., where his home stood for many years. He had a realty company, a company called Quality Creamery, South Bay Building and Loan, and the Chula Vista Lumber Company. That lumber company property is approximately where the Congregational Tower now stands. All total he was a great Rotarian and great citizen of Chula Vista. The 1930s in our club saw the rise of Calvin Lauderbach. He became superintendent of the elementary schools and rapidly made a name for himself. Many schools and parks were named after him. He continued in our club into the 1960s. Lowell Davies, a prominent San Diego attorney who served on the Old Globe board for several years. The stage at the Old Globe is named for him. John D. MacDonald was the superintendent of the high schools. He was a great big fellow, an imposing figure. He was a great speaker. He stepped down as superintendent in 1956. Bob Wilson, my uncle, was a club member in the 40’s and 50’s as an advertising executive. He designed San Diego’s Rose Parade Float several times and was named San Diego’s “Outstanding Young Man” in 1950. In 1952, he was elected to the U.S. Congress and represented San Diego County for 28 years and continued as an honorary Rotarian. Another prominent individual was Joe Rheim. He became president of Rohr Aircraft Corporation, a major factor in the lives of the citizens of Chula Vista. One of the big things that happened in the 1950s involved Rohr who at that time employed up to 10,000 people. A great percentage of them lived in Chula Vista. Therefore they took part in activities in Chula Vista. Two or three of them served in prominent positions being elected to the city Council by Chula Vista residents. They also served on the city of Chula Vista's Planning Commission. Some local folks took offense at that. They thought Rohr was extending too much influence over the city of Chula Vista. In fact they were doing nothing of the sort. Some disgruntled people who may have lost popular elections to these people took up a recall election. The result was two members of the city Council were recalled. Bob Campbell was one and Jim Hobel was the other. Joe Rheim was not a vindictive man but he was a very clever man. Over a short period of time he amassed all of the silver dollars he could find from banks throughout the Western United States. Nobody knew what he was doing. One particular Friday afternoon payday, all eight or nine thousand employees of Rohr were paid in those silver dollars. There were merchants literally lugging gunnysacks of silver dollars to the banks. It made a tremendous impression on the citizens of Chula Vista and an impression on business people all over the country. We saw good service by many Rohr employees after that, many of them fine members of our Chula Vista Rotary club. Stan McMains was a member at this time. He was a bakery owner, councilman, bon vivant and man about town. He loved politics. He would hold forth most Wednesdays in his bakery. He would go across to Glenn's Meat Market and pick out a nice prime rib roast, roast it in his bakery ovens and then provided many an evening of casual political conversation enjoyed by all. All this was with freshly baked potatoes and prime rib all courtesy of Stan McMains. Next to McMains bakery was Chub's Club. Chubb Erwin ran that pool hall and card room for many years. He was a quiet member of our club but his wife Kay was very involved in the Jobs for Youth program which caused many youth in our community to get work through the sponsorship of our club. Joe Bush looked just like a leprechaun. He had a great love of songs. With Jon Miller and Lane Cole and Jerry May they formed a great quartet. Joe would do a program based on a song, for example, “Yes we have no bananas” and convinced the whole audience that that was part of the Hallelujah Chorus. It was great theater. He had a society for the naming of Joe. He would collect a dollar from every Rotarian named Joe. He would do this every year and the proceeds would go to any member who had a son or grandson named Joe. The proceeds went unclaimed. He was a philatelist and a great Rotarian and we miss him greatly.